LARGER OPENING FOR QUICK FILLING: Featuring a large opening with closure on the top, this Umbrella Base Weight Bag can be filled quickly with sands, gravels, peas and other heavy materials using a scoop or a small garden trowel. 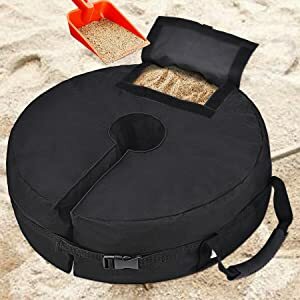 GREAT WEIGHT LOAD PREVENTS TIPPING: This Umbrella Sand Bags can hold up to 90 lbs of sands when fully filled, preventing your umbrella from tipping and your family from injuring even when it’s extremely windy and gusty. 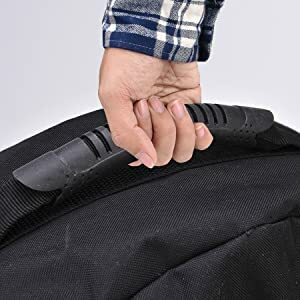 EASY TO TRANSPORT WITH STURDY HANDLE: The sturdy handle built on the side of this Umbrella Anchor Bag makes it handy to transport after loading. No tiring lifting anymore! 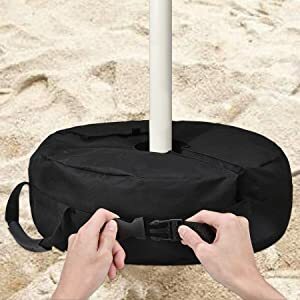 FITS WELL WITH ALL UMBRELLA POLES: You can insert umbrella poles (less than 3.5 inch in diameter) into this Beach Umbrella Weight Bag without much effort since there’s a large center hole and a side opening. And the side strap with buckle closure helps you further anchor your weight bag on the round umbrella base. STRONGLY BUILT FOR ALL WEATHERS: The extra thick Tetoron fabric, sturdy handle and excellent stitching give these Patio Umbrella Weight Bags a heavy duty construction that helps you withstand all weather conditions. No more worries about cracking and leaking in the outdoor environment. Fill without a mess. A larger opening with closure allows for a quick and mess-free filling. One-size-fits-all design. 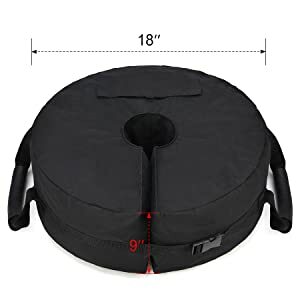 The side opening and large center hole make this weight bag perfectly fit with poles less than 3.5” in diameter. And a side strap with buckle closure helps to further secure the bag to the pole. 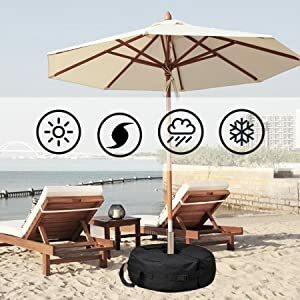 Perfect for patio, beach, offset, cantilever, pool and other outdoor umbrellas with round bases. No more tipping umbrellas. A maximum weight load of 90 lbs ensures that your umbrellas or flagpoles stand upright even in gusty days. Ready for all weathers & seasons. 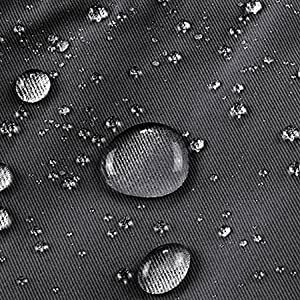 The water-repellent thick Tetoron fabric, excellent stitching and reinforced construction help to withstand all weather conditions in different seasons.